Asamankese in the Eastern Region will on Sunday play host to the myriad of flagbearer aspirants of the ruling New Patriotic Party, where a rally has been scheduled. Party executives, including leader President J.A. Kufuor, Chairman Peter Mac Manu, General Secretary Nana Ohene Ntow, National Organiser, Lord Commey and Regional Chairman, Yaw Gyekye Amoabeng are all expected to grace the rally under the theme, 'Moving forward in Unity', which seeks to offer a common platform for all the about 18 aspirants. 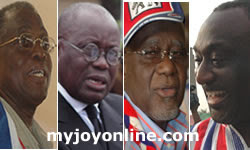 The party intends to officially outdoor the aspirants, each of who is allocated five minutes to propagate his presidential campaign message to the huge crowd expected to be at the Asamankese Methodist Park venue of the rally.The aspirants are Nana Akufo-Addo, Hackman Owusu-Agyemang, Felix Owusu-Adjapong, Dan Kwaku Botwe, Boakye Agyarko, Yaw Osafo-Maafo, Alhaji Aliu Mahama, Kwame Addo-Kufuor, Alan Kyerematen, Kofi Konadu Apraku, Papa Owusu-Ankomah, Jake Obetsebi-Lamptey, Nkrabeah Effah-Dartey, Mike Oquaye, Kwabena Agyei Agyepong, Kwabena Frimpong-Boateng, and Arthur Kennedy. Barfuor Adjei-Barwuah, Ghana’s Ambassador to Japan, is the latest to declare an interest in the race to lead the NPP to Elections 2008. He has already picked nomination forms.The Eastern Region was also the host of a similar rally when in 1998, the party descended on Nkawkaw to introduce its then six aspirants, including President Kufuor.